with the starter enjoyed and the main course devoured, I set my mind to how best to do strawberries and cream – without it being obvious. 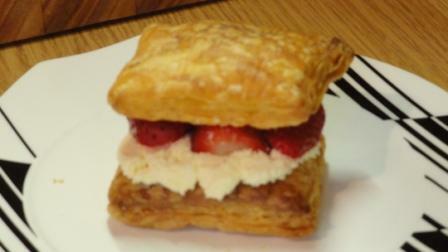 My friend Chantelle asked for some ‘cross aunts’ and this inspired me to make strawberry filled croissants and a strawberry mille-feuille. remember, the strawberries will be hot so do not enjoy straight away! thanks – it has been great fun! numm numm numm !! what a great combination !!! 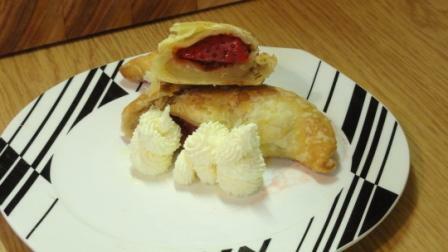 Great riff on good old strawberries & cream! I’ll need to get my behind into gear to complete my challenge, right? Oh very good, Tandy – these look wonderful, I love that ‘cross aunt’ with strawberries idea! Well done!!! Now this is exactly what I had in mind when I gave those ingredients – great minds do think alike! Wonderful! Jolly well done with your use of ingredients in the challenge. I normally have coffee at around nine. How many can I expect to be delivered by then??? No no! Not Thank You Very Much … what time are my pastries being delivered??? you must have missed the delivery!